From almost 30 feet away, another ice angler sitting over his own 8-inch divot shouted, “Whoa! I think I just saw your fish swim by.” I turned and looked his way, trying to gauge the distance and decide what I should do next. If I’d been hooked up in open water, I might have moved to fight the fish from a more advantageous position. But when a big fish powers off under the ice, it’s not as if you can follow. You have to stay where you are and slowly, carefully, bring that fish back to you. And that’s what I did—with a little help and encouragement. As I managed to coax back a few yards of braided line, a friend began arranging the braid in large loops beside me on the ice. The ice was crusty from a mid-morning sun, and I was glad for this help. When the pike made its next run, I was able to feed loose, tangle-free line smoothly down the hole. This is imperative when fighting a hard-charging fish through the ice. The other thing I did—after a little prompting—was keep the sizzling line away from the edges of the hole. By holding the line in a hand centered over the hole and guiding it at a wider angle, I prevented it scraping against the sides. If I’d let the braided line slide along the edge, it probably would not have been cut by the ice, but I wouldn’t have felt the changing pressure as cleanly. Being able to anticipate the fish’s next move and respond quickly is another important aspect of catching a big one under the ice. Of course, the most important rule in handling hard-chargers is the same regardless of whether you are in a boat, on the bank, or working through a hole in the ice: let ’em run. Too often, anglers are overcome by their own adrenalin and clamp down on the line, thinking they need to stop that powerful dash. Nothing could be worse. When a big pike feels the bite of a hook and the pressure on its toothy jaw increases, it speeds up like a freight train running through a flat crossing. Trying to stop this run is futile. It just results in a broken line or a pulled hook. Let the line slide through your fingers, keeping just enough tension so the spool beneath the tip-up doesn’t spin out of control. But don’t let the line fall loose and the hook drop out. When the pike first takes off, the flag on the tip-up will shoot to the sky. If you’re tending a number of traps, you’ll probably see this and run to the tip-up as line continues to play out. Once you get there, it’s important to smoothly pull the tip-up out of the hole. To do this, lightly grasp the line beneath the spool. As you do, use your other hand to lift the tip-up over your head or away at arm’s length to the side. Doing this, you pull a few more feet of line off the spool, line you can feed out if you need to. If you don’t free this line but only place the tip-up and spool beside you, when the pike charges away, it may pull the spool back to the open hole. This may prove disastrous. Based on whether the pike is running or stopped, the angler has to decide if and when to set the hook. My rule of thumb is this: when the angle of the line is straight down, or only at a slight angle, I judge that the pike probably has not pulled a lot of line off the spool, yet, and is lurking somewhat below me. In this situation, the pike may be waiting to change the position of the baitfish in its mouth before running off. I wait until the line is yanked away again before setting the hook. On the other hand, if the line from the hole to the fish already is at a sharp angle, or if I see that a good deal of line already has run off the spool, I figure the pike has probably set the hook itself. If it’s still running, I let it go. When it stops, I pull back, but ever ready with that free line for the inevitable charge to come. It’s not always a clear-cut decision. Yet basing it on these considerations works for me more often than not. When this pike slows with a lot of line already out, I know the hook is set and begin retrieving line a little at a time. Five or six times, the pike dashes away after I have pulled it back near the hole. But by feeding out that carefully looped line and then very carefully pulling it back in, I keep bringing the fish around. Now comes the moment of truth, one of the great feats in fishing. With the big pike swimming slowly beneath me, I center its head in the ice hole. It takes a while, and a few more short runs, but as the pike turns one last time, I raise its nose slightly with a tight line. My friend, who also is kneeling, facing me over the ice hole, reaches in with amazing speed (and nerve). He makes a two-hand grab under the pike’s gills and lifts. With those gills flaring and mouth chomping, the 17-pounder is quite a sight. After my friend lifts it up out of the water, he tosses it onto the ice to the side of the hole. 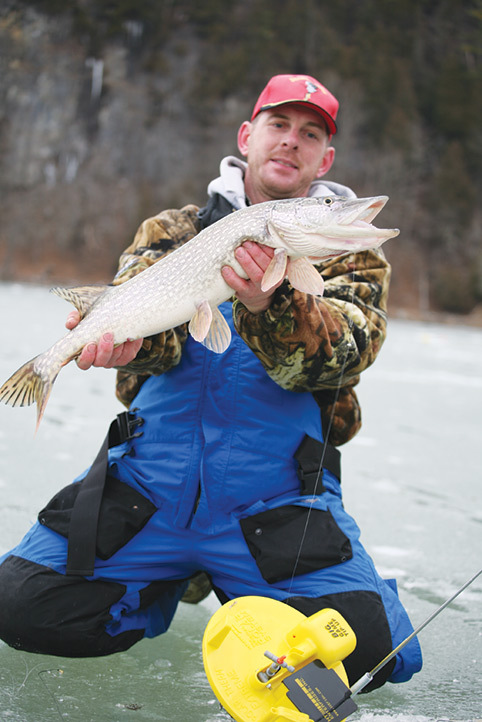 Of all that goes into catching a big pike under ice, the how-to of fighting and landing it is most important. To some, this might seem like putting the cart before the horse. But if you aren’t ready with a plan and good fighting technique, all of the effort you put into finding big pike, selecting the right bait, rigging the tackle, etc., will go for naught. Before addressing any of the rest of it, I would like to discuss a few more of the particulars required when fighting big pike under the ice. As already noted, when first starting the tug-of-war with a northern, it’s important to pull several feet of line from the spool so that line can be released quickly when the fish runs. It’s a certainty that a big pike will run. And to make sure this line can be fed freely, an angler first must be careful about how the tip-up is placed over the ice hole. When using a wooden frame tip-up with star-point structure, lay the top prongs down on the ice and keep the spool in the air. This can be a bit tricky, and the frame still may be pulled over and the line snag on it. This is one reason I’ve become a fan of disk tip-ups for pike. Plastic disks may not be traditional, not as aesthetically pleasing as wooden tip-ups. But the round HT Enterprises devices I’ve been using allow me to just lay the circle on edge and keep the line away from entanglement. As line runs off, it flows free and unhindered, only contacting the smooth edge of the disk. Sturdy equipment is also important, and that thick plastic HT disk is up to the task. Also, the disk completely covers an 8-inch hole, blocking any light entering. The gaps in frame tip-ups let unnatural shafts of light penetrate, and savvy ice-anglers claim this can dissuade a big pike from striking. Also, the HT Model 500 L is equipped with a battery-powered light that beams-on when the flag raises. I find this very helpful when fishing in low light. I use a backing of braided line as opposed to a full spool of mono. There are two reasons for this. First, it’s easier to grip braid when fighting a fish; second, the darker line is much easier to see on the ice. Mono can disappear in the glare on the ice on a sunny day, and I’ve had trouble finding let alone picking up mono during a pike battle. Braided line needs a leader of some kind, and among pike anglers, the best leader will always be a matter of debate. Some say a wire leader is necessary to prevent sharp teeth slicing through. Others say a wire leader reduces the number of bites, and they prefer to take their chances with more strikes on mono. Last year, I used 20-pound-test fluorocarbon leader with 30-pound braid backing, and I caught a lot of big pike while losing only a few to cut line. When considering what type of leader to use, think also about the bait you’ll be using. Throughout most of last ice season, the folks I fished with preferred 2-inch fathead minnows for big pike. I know this goes against the big bait, big fish theory, and, frankly, I was surprised at everyone’s success. But those small fatheads on fluorocarbon leaders produced big pike for a number of weeks. There came a time when young perch invaded the weedy flats we were fishing. After that, we couldn’t keep a small fathead on a tip-up. Then, most of my fellow anglers switched to larger 4 and 5-inch shiners, the size normally associated with pike fishing. About this time, I also started to hear complaints about more break-offs, more line cuts with mono or fluorocarbon. I think this is because when a pike takes a small fathead, it takes it in one gulp and the hook sticks quickly inside its mouth. Also, the smaller fathead goes on a size 4 hook, which can quickly find a soft spot in a pike’s mouth. But with a larger shiner on a larger hook, size 1 or 1/0, the pike may need to turn the bait before swallowing. In doing so, it exposes the line to more of those razor teeth. A couple of other friends switched to black wire leaders along with the large shiners, and they did fine. The wire-or-mono debate will surely rage on. The rest of the terminal rigging couldn’t be simpler. In addition to the single-shank hook, you need a snap swivel and a split shot. The shot is snugged up against the swivel to help keep the bait from swimming up. Many anglers like to present the bait a few inches down in a weed bed or just above the weed tops. In water less than 10 feet, but with high weeds, pike will come up within a few feet of a hole to grab a bait. A couple of times last season, friends reported pike taking baits that were set 2 feet below the ice. And this was not just at the beginning or end of ice season. It occurred even under the thickest ice. One of the most exciting moments I experienced last season came when a pike grabbed a minnow as I still was lowering it into the hole. The bait was maybe 4 feet down, with my hands still on the line, when the pike took it and rocketed off. Fortunately for me, I was able to pull the braid from the disk tip-up, and then the battle was on. Fishermen who never venture out on the ice never know moments like that. As comfortable as an easy chair beside the fire may be, I’d much rather be out there on the ice battling big northern pike, and with the right battle plan, I land many more of them than I lose.